We are getting to that time of year again, when graduates are completing their studies and will be entering the job market. Previously we’ve discussed summer job trends and what are the jobs of the future for Canadians, and we’ve touched on students taking temporary jobs in the summer. However, as a student, have you ever wondered if your education prepares you for actual employment? Of course upon completion of your schooling, you will have learned about skills required to work in your desired field and as a result be receiving some type of designation, but has your education prepared you to enter the actual workforce? Just this week, Maclean’s announced results from their annual student survey. The survey which polled nearly 24,000 students across the country asking them whether their university education is preparing them for a job and if their schools are preparing them for post-graduation employment. Here’s a quick peek at some of the results. As part of the survey, students were asked whether their university education is helping them gain skills and knowledge for employment. Here are the top ten schools that students felt were best helping them prepare for employment post-graduation. Waterloo – 66% strongly agreed and 27% somewhat agreed. Francis Xavier – 65% strongly agreed. Sherbrooke – 63% strongly agreed. Queen’s – 55% strongly agreed. Bishop’s – 54% strongly agreed. Wilfrid Laurier – 53% strongly agreed. Nipissing – 52% strongly agreed. Cape Breton – 51% strongly agreed. UOIT – 50 % strongly agreed. Ryerson – 50% strongly agreed. More results available in the full article, which is available at Macleans.ca. 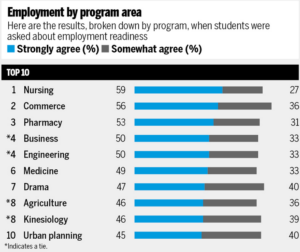 So, it appears that many students feel that their education is in fact preparing them for employment. Of course, this may vary depending on the field of study, the job market in the various fields and location. However, the debate goes on especially if we consider education at the high school level. There has been a lot of discussion that high schools should better prepare students for work and not college or university entrance exams and that schools may need to revamp their curriculum to focus on skills. “Employers have stated that they are looking for employees able to display the “4 C’s”: to think Critically – solve problems and draw sound decisions – as well as working Creatively, and able to Communicate and Collaborate on a systematic basis.” – Charles Fadel, founder of the Center for Curriculum Redesign. Even starting in high school, students should be developing the attributes they need to succeed in life and at work. Does education prepare you for employment? The answer is that it should, but how much may be determined by the courses you take, the field of study and the types of jobs that you apply for. Looking for a job? Need assistance with your search? Contact us today to set up a consultation. Speak with one of our experienced HR consultants and begin preparing for your journey into employment today!